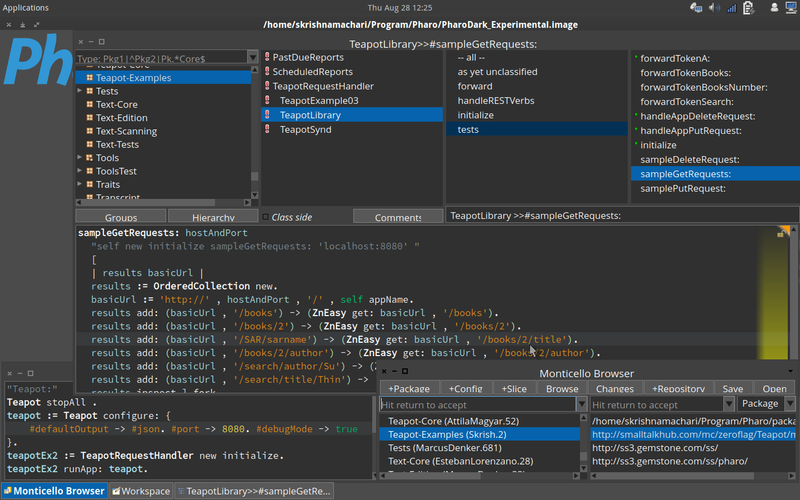 Diving mostly into Java these days, it was just sheer bliss to attempt to cook up a sample app with a new framework in Pharo: Teapot. Extend it do a flexible simple app workout. * Override the #forwardTokenA: request method and you are quickly off the block to custom respond to the request. There on, you can follow the example in TeapotLibrary to forward additional tokens of the url to make it return data as reqd. * The beauty is that in Pharo, now you can change anything, the appName / the response data / any or all of the URL paths et al in the methods of the new subclass. * The tests from the browser or using ZnEasy ( as in #sampleGetRequest: ) is instantaneous. None of the edit, compile, restart webserver stuff here..
From the drudgery of eclipse and its stack to Pharo and its frameworks, Zn / Teapot et als, its sheer bliss. #defaultOutput -> #json. #port -> 8080. #debugMode -> true }. teapotEx2 := TeapotRequestHandler new initialize. http://localhost:8080/Library/books/1 ; http://localhost:8080/Library/search/author/skr ; http://localhost/SyndLoans/FAC/12HJ3456 etc.. The cool dark theme in Pharo is nice on the eye with its contrast too: bit of Indian Flag look with text in white, orange and green along with the soft grey-blue.. nice on the eye.. yellow highlight on the edge.. ! This entry was posted on Thursday, August 28th, 2014 at 6:58 am and is filed under Uncategorized. You can follow any responses to this entry through the RSS 2.0 feed. You can leave a response, or trackback from your own site.